I've known of Three Birds ever since my first visit to Cleveland. 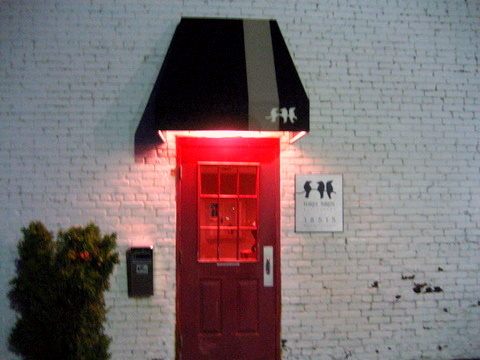 Back then I was just learning to appreciate foie gras and Three Birds was the only restaurant that had foie on its menu online. The restaurant is supposed to have one of the better patio areas in Cleveland, but it was dark and rainy the night we went so the patio was closed. We entered through the back door, and while the door itself looked well-kept, the wall looked like it had seen better days. 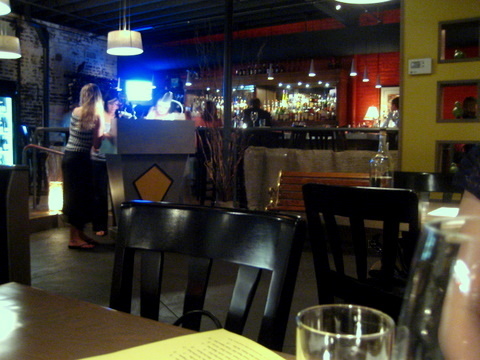 The restaurant itself is dimly lit, with an industrial interior feel and most of the light coming from the open kitchen. In the middle of the restaurant there is a little glass engraving of what else 3 birds. The restaurant has custom labeled water bottles, that they leave on the table. Nice to be able to refill water without being at the mercy of the waiter. 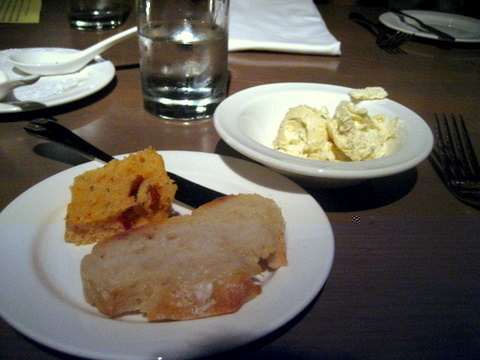 We were also brought a tin pail with two types of bread, sourdough and this sweet pepper bread that was quite good. 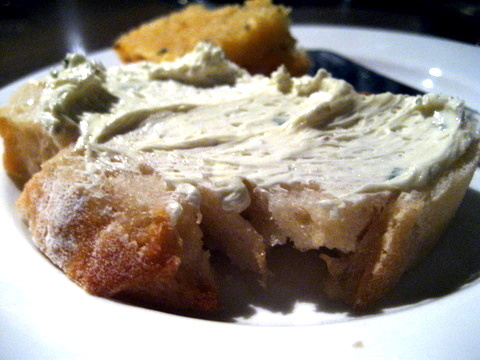 The butter tasted strongly of herb and garlic and went quite well with the sourdough. I really could have done without this, dry, hard, and tasteless morsel. 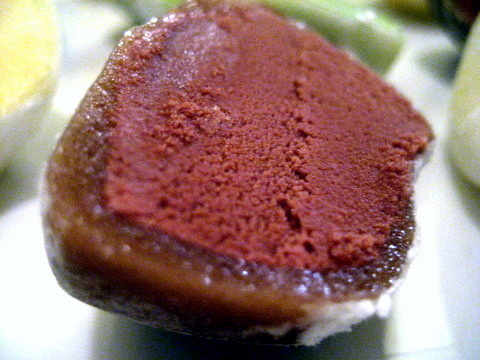 Once my favorite preparation of foie gras, searing has fallen out of favor and been replaced with terrine and au torchon preparations. 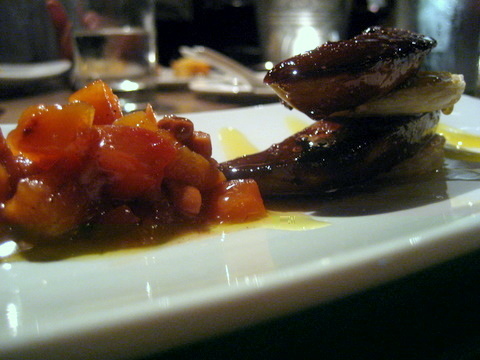 Still this was a decent quality sear, the foie was soft and still maintained the intense fattiness foie gras is known for. The use of peach and ginger gave the right amount of sweetness to the liver. I was a bit leery of ordering the ceviche because I wondered how fresh the seafood would be. 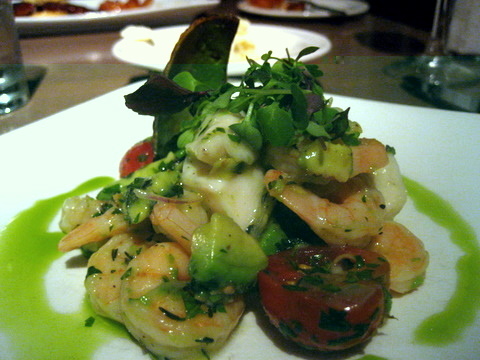 The dish was made up of mostly shrimp, scallop, and avocado giving it a blunt dull flavor that overwhelmed what should have been a lively citrus marinade. The shrimp turned out decent enough even though the scallops were rubbery and flavorless. 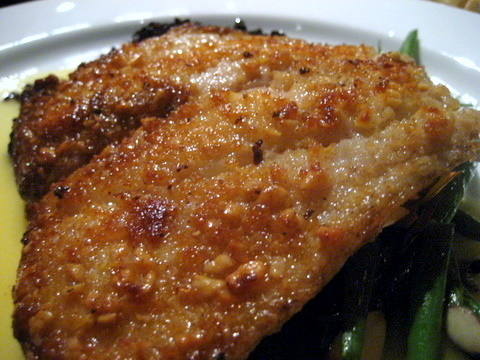 The snapper came out golden brown resting atop a bed of rice and green beans. 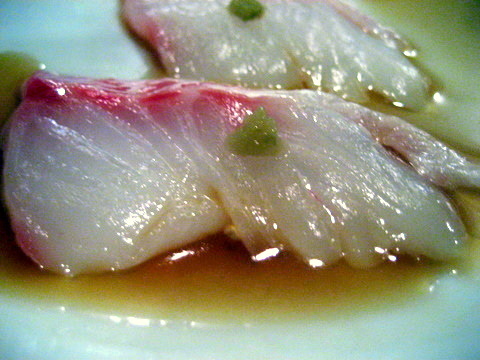 The fish itself is nicely done flaky but not too firm, as if the butter sauce had seeped into the meat. Even though orange appears twice in this dish, the citrus flavor in both the fish and the sauce was largely a supporting element to the butter and almond. I appreciated two of the three elements in this dish. First the meat was tender and very flavorful, a bit more well done than I liked but still possessing a soft texture that is wonderful to bite into. 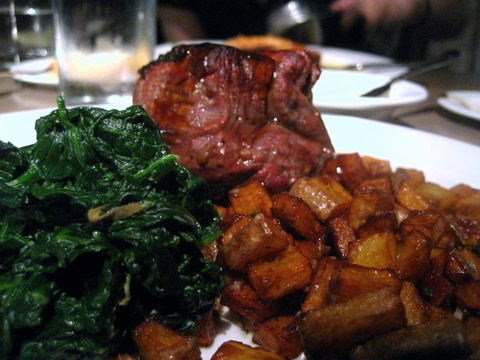 The spinach was a nice accompaniment, slightly bitter it was a stark contrast to the richness of the meat. The potatoes were a bit overcooked and fried in oil resulting in very hard little squares that sort of oozed oil when you bit into them. 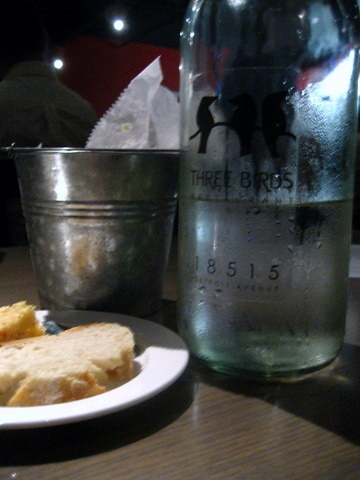 I am kind of ambivalent about Three Birds, while it didn't blow me away, the food was good enough. 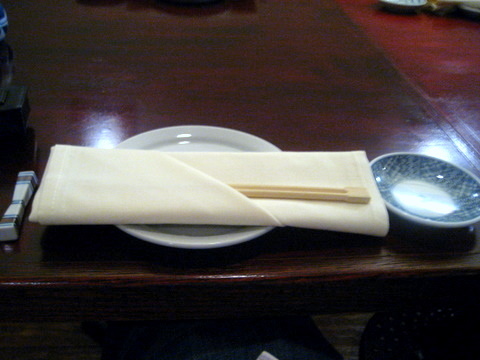 I felt most of the dishes were fairly standard, with nothing unique to make me identify it with the restaurant. The restaurant has some good points and I can see why people would think highly of it but I am not entirely sold. After being extremely impressed with my first visit to Flying Fig, I made a point of stopping by for my first dinner back in Cleveland. The quality of the produce from my first visit has stuck with me and I find myself using Fig as the gold standard for fresh vegetables. I recently learned the restaurant is walking distance from the West Side Market, and I wonder if the market is actually the source of the high quality produce. A very colorful insalata caprese, the tomatoes here definitely took center stage, red, green, yellow, and purple; each color also had a distinctive flavor. 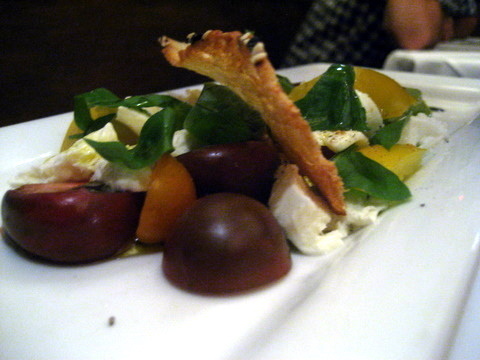 The purple tomatoes were the most impressive, I don't think I've ever had a tomato that sweet. I loved the haricot vert last time I was here so I figured why not get a big plate of them to start. Apparently the restaurant distinguishes between haricot vert and green beans, not surprising given the attention paid to the produce. Haricot vert tend to be thinner, crisper and have a more complex flavor than the standard green beans. Still these green beans were nicely cooked. I didn't care for the ponzu sauce but the sweet and tangy pineapple caramel sauce really did the trick. This is one of those rare dishes where a number of flavors and textures come together in a perfect storm of deliciousness. 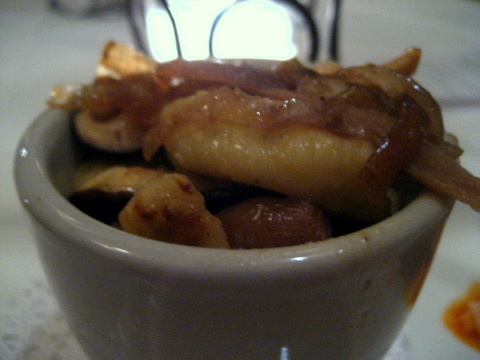 I particularly liked the interplay of the salty bacon and the earthy-sweet dates. I really wish I could describe the sensations in more detail but there were just so many things going on, better to try it for oneself. This dish was a bit out of place in the trio. The other two dishes were both so bold and adventurous this one simply became forgettable by default. Not to say this was a bad dish by any means, the rabbit was tender and rich and the plump gnocchi had a beautifully soft texture. This was a special my first time here and I am glad to see it made it onto the regular menu. 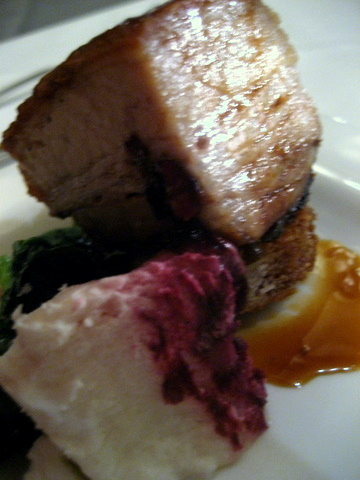 The pork belly was a touch drier this time around but the fattiness compensated nicely for that. The local greens weren't as impressive as I remember, but the goat cheese had the same bold spice and ethereal sweetness. I was having a hard time choosing an entrée and I finally settled on the duck because it came with haricot vert which so impressed me last time. The duck breast was a bit on the lean side, but moist and very tender. 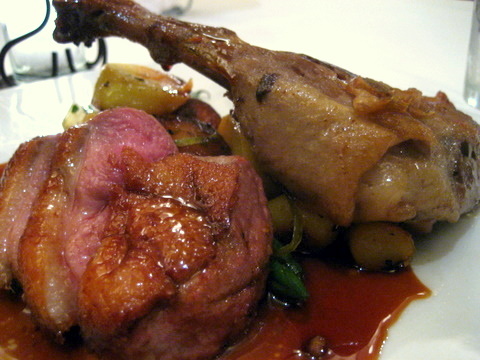 The confit was also quite good which is high praise from me, I tend to find confit very flavorful but too dry for my liking. 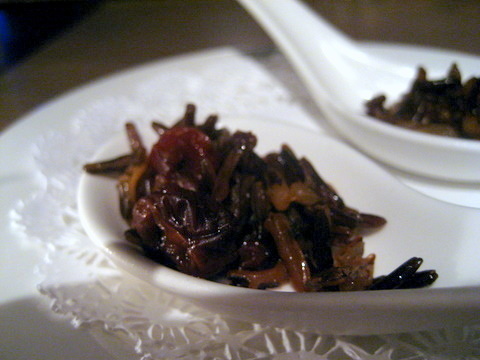 The sour cherry reduction was a bit too tart resulting in a jarring contrast with the bird. Of course the prized haricot vert was just as good as last time, crunchy and sweet with a hint of grassiness. By this point we were a bit too full for our own good but how could we skip out on dessert. We split a slice of the homemade blueberry pie. 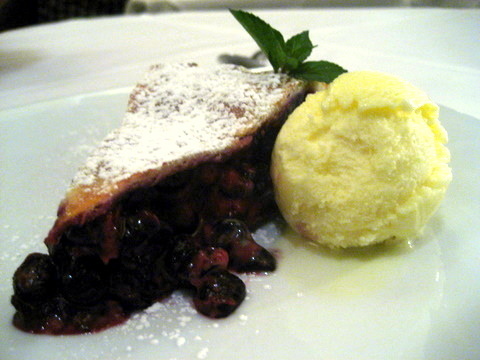 I didn't care too much for the pie since I am not a big fan of spiced desserts but it was decent all things considered. There was another flavor element to the ice cream besides mint, molasses or some such, but the mint definitely dominated. What a great way to come back to Cleveland. So often expectations can rise out of proportion after wanting to try a restaurant for so long, but Fig managed to meet and exceed my expectations again. As with my first visit, the vegetables are on another level at Fig. If I ever become a vegetarian, I might just have to move to Cleveland. I have been curious about Jinpachi for quite some time. 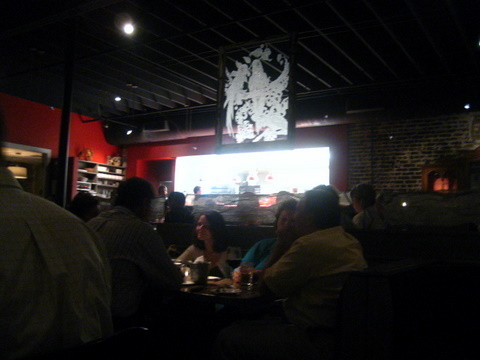 When I first heard about this place, people spoke highly of the fish quality. In addition, the chef's wife is a Spago trained pastry chef and handles the desserts, going so far as to offer a dessert tasting menu. 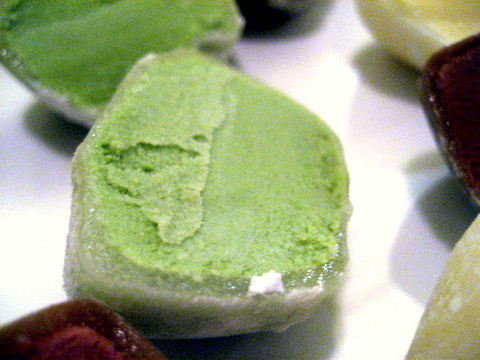 The attention given to dessert is quite refreshing as most sushi restaurants tend to treat dessert as a sort of afterthought. I only finally tried the restaurant when I was invited to an omakase dinner with Los Angeles area food bloggers courtesy of www.FoodDigger.com. The goal of the dinner was to foster a stronger sense of community among food bloggers in the area and I was honored to be invited. Big thanks to Thi, Will, and Aaron of FoodDigger. 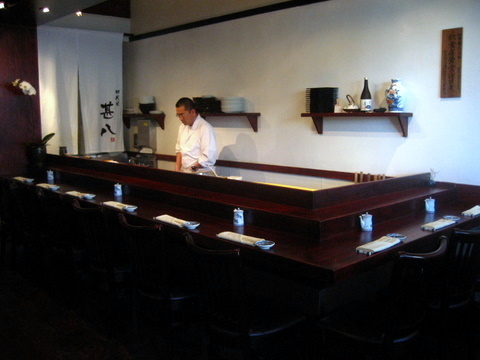 The restaurant consists of a sushi bar and a couple of tables as well as an upstairs area capable of handling a large party. 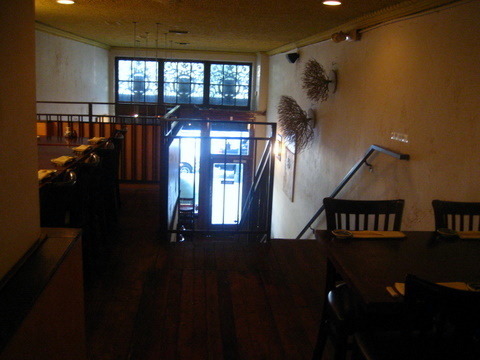 There were also a couple of smaller tables upstairs. 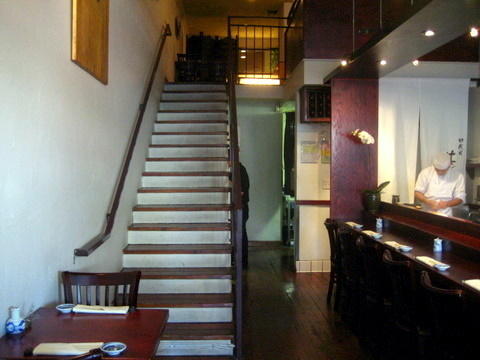 I felt a bit odd sitting upstairs, typically at a sushi restaurant I like to be able to see the chef, being upstairs somehow made me feel less welcome. I understand this is a function of our party size and not any undesirability on our part. I got to the restaurant a bit early which gave me time to take some pictures and relax with a beer. 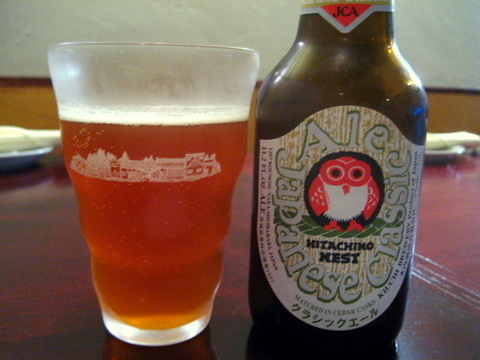 I decided to try a Hitachino Nest IPA. On the bottle it says the beer is aged in cedar. When poured, the beer has an amber-orange color and I detected some fruity floral notes as well as some bitter woodiness. From there we went onto Juyondai sake, more expressive than Kubota Manjyu, this sake is quite sweet and is a bit rougher around the edges but still goes down extremely smooth, definitely one of the better sakes I have tasted. 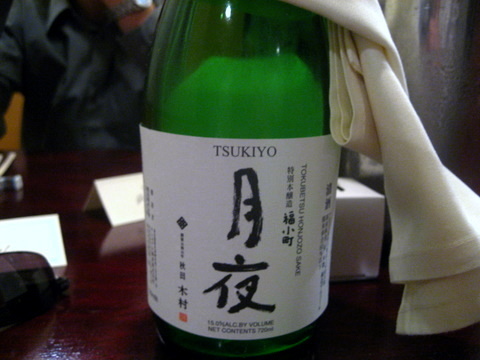 We finished up with a big bottle of Tsukiyo which I thought was a little less focused than the Juyondai, a bit more rice on the palate and a bit harsher going down. It would have been a solid sake had I drank it first. We ordered some appetizers to start things off, mostly finger foods to go along with some sake. This was a nice way to ease into dinner and gave people a chance to talk before we got down to the real business of stuffing our faces. I must admit I was a bit wary of this course. 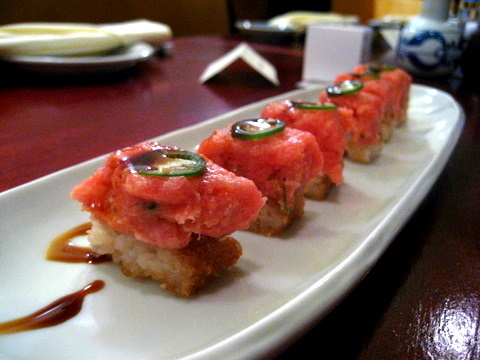 The tuna was unspectacular but solid and contrasted nicely with the texture of the crispy rice. 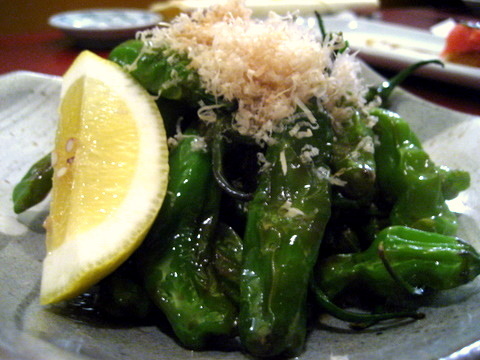 These peppers came deep fried with a bit of soy and topped with smoky bonito shavings. The peppers themselves are thin skinned and have a mild sweetness and the occasional flash of heat from some of them. 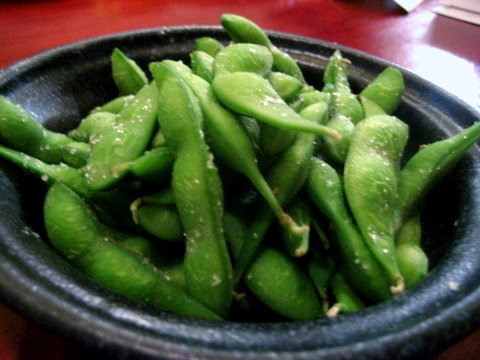 The ubiquitous stereotypical appetizer at a Japanese restaurant, these came out moist and lightly salted, not bad for edamame. Finally the real food. 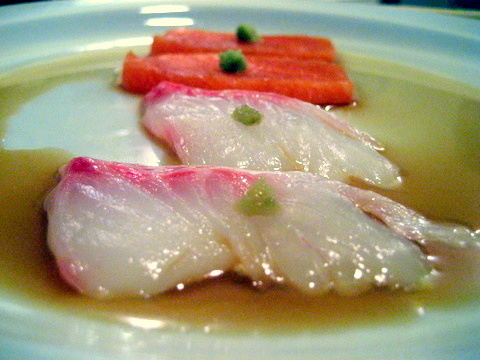 We were given a plate of sashimi to start. The Tai was firm and light and the Yuzu Kocho gave a tart peppery flavor that feels appropriate for the fish, sadly there was plenty of tendon in both pieces marring the uniformity of the texture. 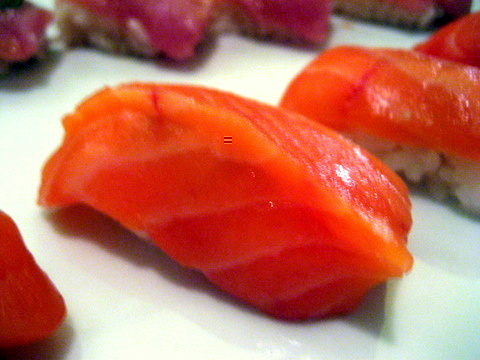 The salmon was subtly rich good flavor but a bit too soft for my liking. 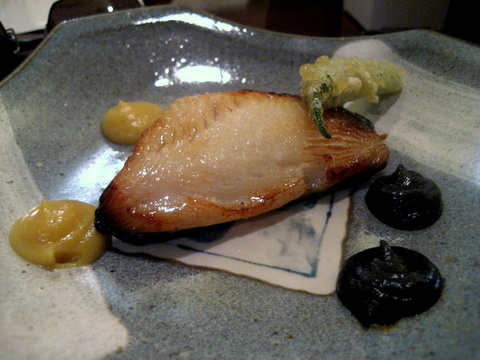 Black cod tends to be quite fatty and the grilling chars the outside giving it a nice flavor as well as melting the fat. 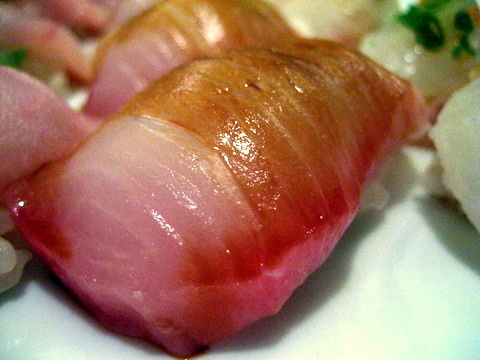 The resulting fish tends to be a bit charred and crispy on the outside and flaky and moist inside. The fish looked like it had been glazed with a miso sauce and had plenty of flavor, the dipping sauces presented a nice aesthetic but were totally unnecessary. Fairly clean and soft, good but nothing to write home about. 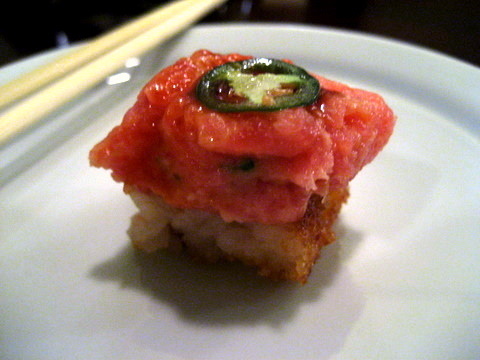 It might be a bit uneven, but I tend to judge a sushi restaurant heavily based on the quality of it's toro. 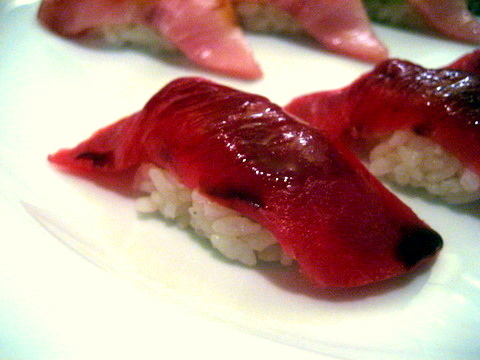 This was a bit leaner than some of the toros I have had but the lack of tendon and gristle made up for a lot. 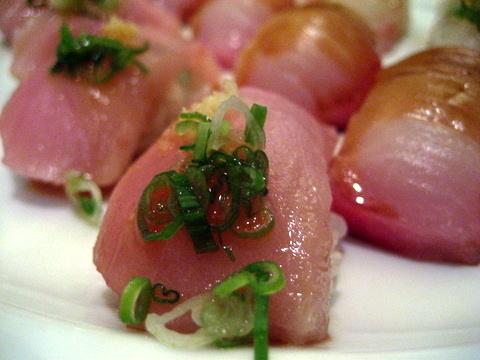 One of my favorite fishes of late, the soft oily albacore contrasts with the acidity of the ponzu and the freshness of the scallion. 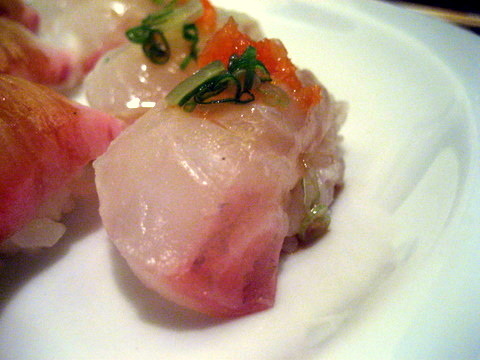 Definitely the weakest of the three white fish nigiri pieces. The yellowtail was good but lacked any distinguishing characteristics. Halibut used to be one of my favorites, but has fallen out of favor of late still I enjoyed this piece with its firm, slightly chewy texture. 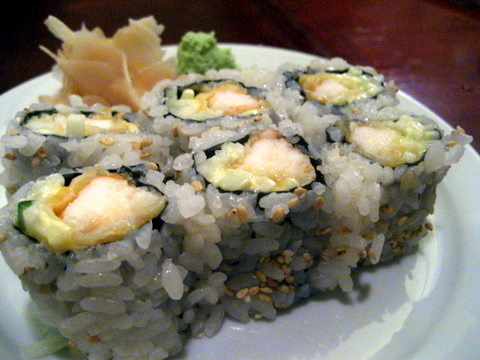 The shrimp tempura roll definitely exceeded my expectations. 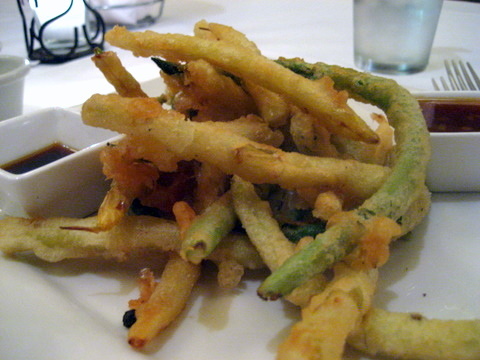 A warm nicely fried shrimp tempura with some slightly pickled cucumber and creamy mayo. 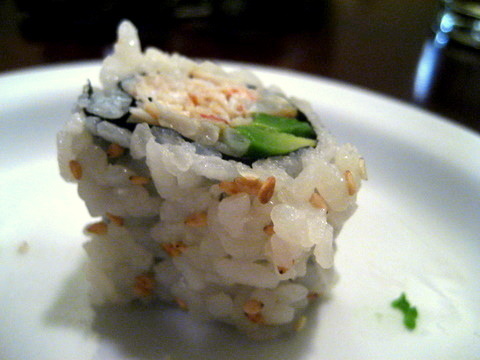 The tanginess of the cucumber really added an extra dimension to the flavor of the roll. 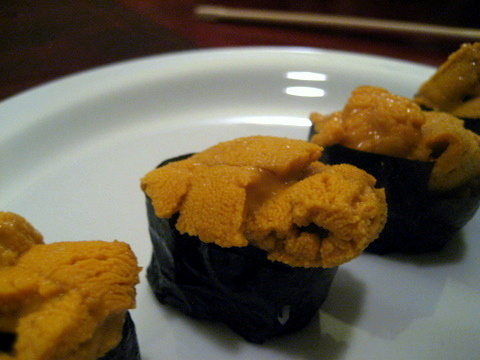 Probably the one piece of sushi I am as often disappointed with as not, Uni along with Toro tends to be one of the barometers I use to judge the quality of a sushi restaurant. Uni has to be served fresh and this was a great example of that, a uniformly smooth and creamy texture along with a briny sweetness. Wonderful! I actually mistook this for a California Roll at first but tasting it the difference is clear. True blue crab meat is so much sweeter and more complex than imitation. 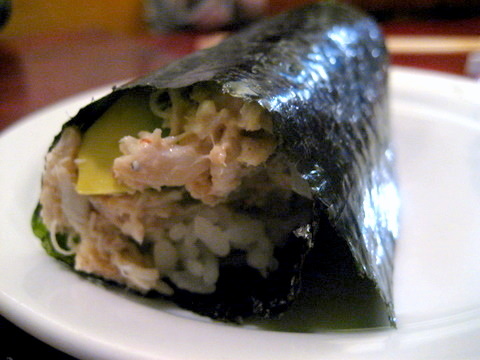 This was the first time I had true blue crab in a cut roll, typically it comes in hand roll form which we would have later. 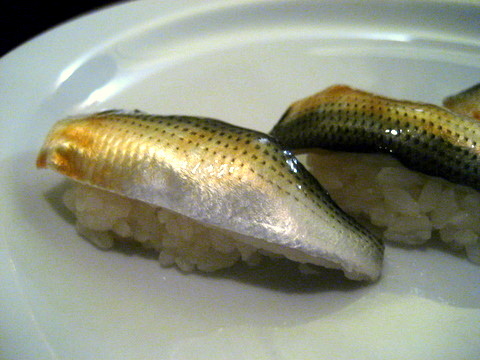 Prototypical Kohada, kind of fishy and dry. This fish can be a bit tough and I think a bit of scoring would have helped tenderize the meat. This one definitely takes some getting used to. Because nobody was satisfied with the small tastes we had of the blue crab at Jinpachi, we each ended up ordering a blue crab hand roll to supplement our meals. 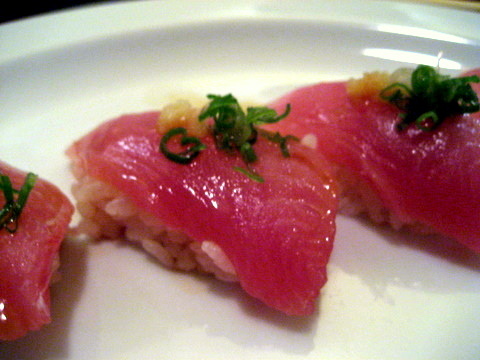 This is one of the few times I have had salmon nigiri unadorned with either bonito shavings or preserved kelp. It was quite nice to get back to basics and focus solely on the fish. 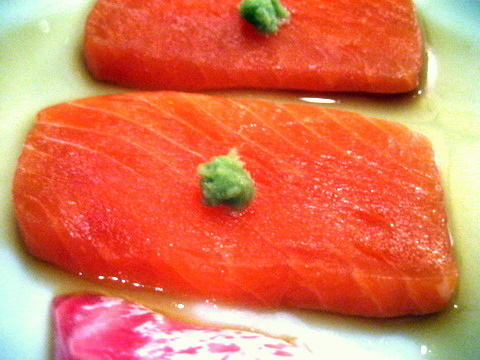 This salmon had the freshness and flavor to handle center stage unaided, but as with the sashimi was a bit too soft for my tastes. 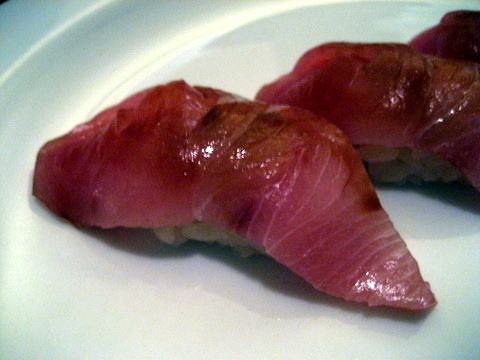 We were told this was albacore although the color was drastically different from what we had before. 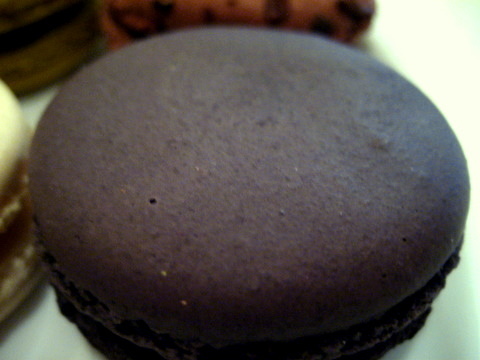 Either way this was soft flavorful and delicious. Part of the appeal of Jinpachi is the desserts match the quality of the rest of the meal. Sadly we learned this is no longer the case as Fujita-san's wife no longer does desserts here. 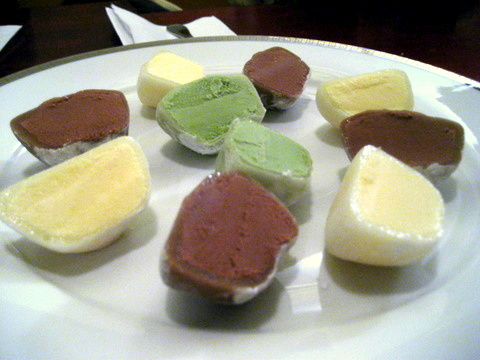 Instead we were given a plate of mochi ice cream halves. 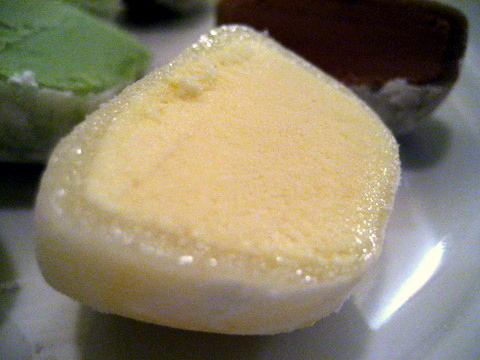 While they tasted fine, they were the same mochi ice cream I could pick up at the super market. 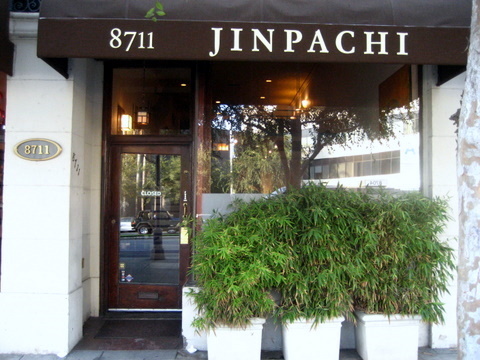 In a city with plenty of great sushi restaurants, Jinpachi's desserts truly set the place apart and it is too bad that is no longer the case. 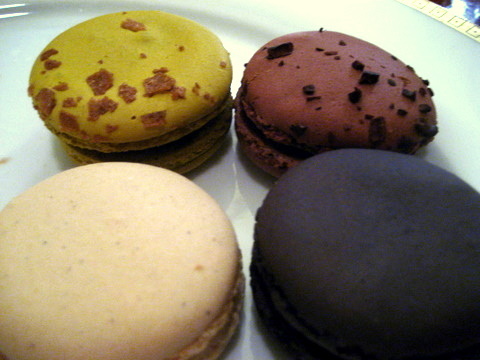 These were easily the best macarons I have ever had. 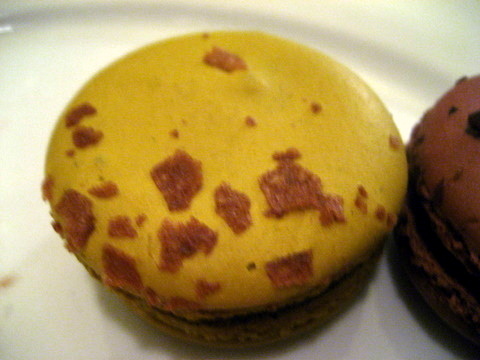 Typically macarons come as petits fours to end the meal, they are always an afterthought, one small pastry among many others. 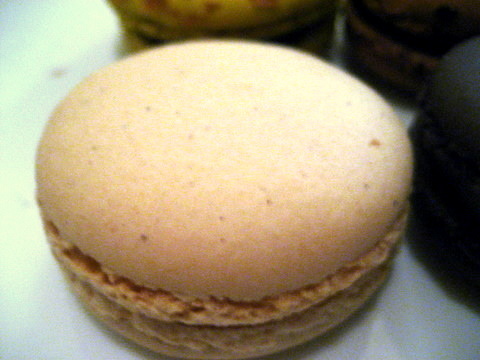 This is the first time I have had gourmet macarons and what a difference it makes. 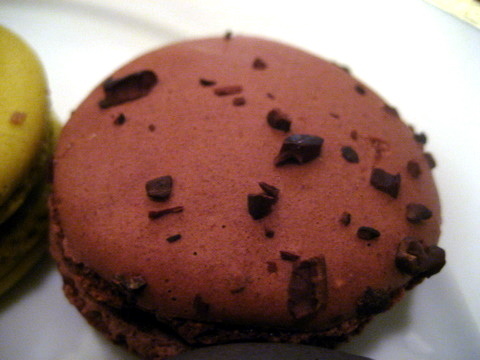 The cookies are perfectly moist and chewy and the ganache is laden with flavor. 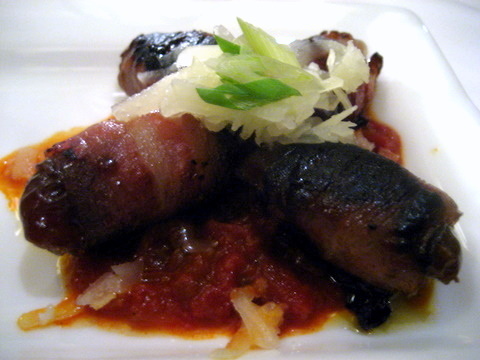 The use of more complex and adventurous flavors pays off. Of the 3 I tasted, I distinctly remember the Violet Cassis, a wonderful blend of sweet and tangy with some fruit and floral aromas. I ended up being pleased with Jinpachi, the food is quite good although perhaps not quite at the highest level of LA sushi. Although my biggest complaint is that there is nothing distinctive about the food, no single course do I clearly associate with Jinpachi (well maybe the Juyondai Sake). The return of the dessert tasting would be a huge impetus to return to the restaurant as I feel I only got part of the Jinpachi experience. In addition. if I do return I will make a point to sit at the bar as I felt our experience was somewhat diminished by our chosen table.